Hilton Garden Inn will close out 2017 with more than 750 hotels worldwide. The brand now has properties in 35 countries and territories. Six openings have occurred this month alone in locations such as Oklahoma City, India and Malaysia. “These properties offer both business and leisure guests upscale yet affordable accommodations, while also providing best-in-class offerings for a brighter and more comfortable stay,” says John Greenleaf, global head of Hilton Garden Inn. The strongest growth occurred in the southern USA. Texas and North Carolina accounted for eight openings collectively. The brand also introduced properties in two Manhattan locations: Hilton Garden Inn New York Times Square South and Hilton Garden Inn NYC Financial Center/Manhattan Downtown. 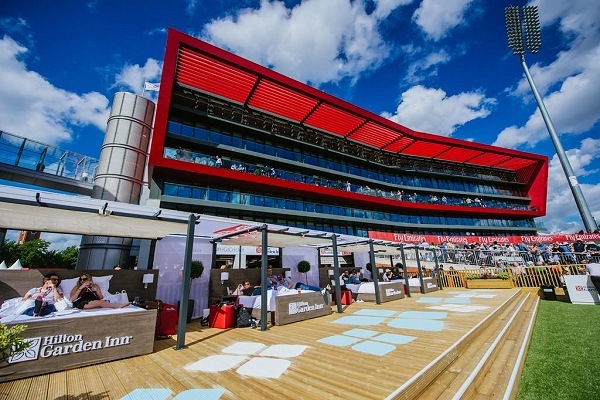 One of the most interesting openings was the Hilton Garden Inn Manchester (pictured) located within the Emirates Old Trafford Cricket Ground with 85 pitch-facing rooms, most with balconies, making it a perfect place for sports fans to watch a match. The modern hotel is also a 10 minute walk to Old Trafford, home of Manchester United Football Club. Internationally, Hilton Garden Inn debuted several new properties in Asia, Latin America, the Middle East and Europe.